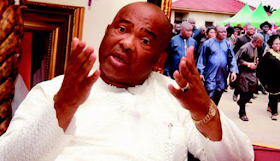 A court in Abuja ordered the police to arrest Senator Hope Uzodinma (representing Orlu Zone, Imo West) and present it before September 25 this year. Judge Abdulwahab Mohammed of the Grade 1 Area Court, Kubwa Abuja, gave the order on Tuesday after Uzodinma did not attend the court to respond to a pending criminal complaint directly against him. "Pursuant to Section 131 of the 2015 Criminal Justice Administration Act, an arrest warrant is issued against Senator Hope Uzodinma for not having attended the court to answer the pending lawsuit against her," the judge said. . The lawsuit was issued against Uzodinma and its two companies by Chitex Ventures Ltd and Chima Akuzie, who alleged that the Senator granted them a non-cash check of N200 million UBA (bounced check).